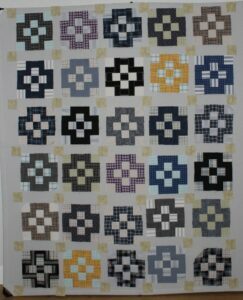 All 30 blocks for the Nifty Thrifty quilt are done and now I am working on the sashing. I found a piece of light green fabric in my stash for the cornerstones. The sashing is a dark blue and a gray taupe fabric. I am not sure yet what I will do about the border, but hopefully I can find something in my stash. I have pieces cut out for two more shirt quilts and then the rest of the fabric will go into my regular stash bins. Using recycled shirts was a fun experience, but I probably won’t buy any more. Sometimes we have to try something to learn that it is not our “cup of tea.” My T-Mon always told me that your needed to try things at least 3 times to make sure you didn’t enjoy them. Thought I didn’t like scrappy, but now I do! But I STILL DON’T LIKE GREEN PEAS!